In our second issue, we tackle a question that resonates with women all over the world -- why are women so poor even though they work so hard? As the rich become richer and the poor become poorer, we cannot ignore this paramount fact. 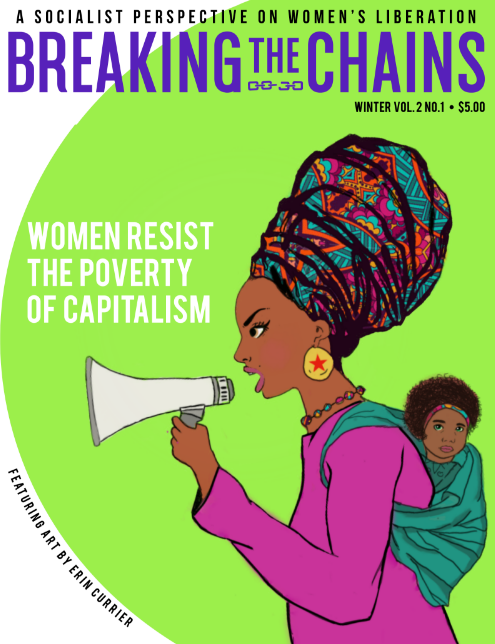 Beyond exposing how poverty affects women through economic and sexual violence, we analyze poverty as a necessary product of capitalism’s need for profit and juxtapose this reality with socialism. This is a critical point to understand especially as the women’s movement gears up to fight against President Trump’s sexist, racist, and xenophobic agenda. From Standing Rock to Ciudad Juarez, the urgency to fight for a new system has never been clearer. Some of the featured articles include a historical example of how poor and immigrant women in Massachusetts organized for better workplace conditions, a Marxist analysis of why women are poor, and a piece that argues why women will not retreat but build a mass movement against the Trump agenda. We also have art, poems, and an exclusive in-depth interview with Gloria la Riva.